BAReeeeeeeeeeN – BACK-ON’s collaboration with GReeeeN! There hasn’t been much activity from the official BACK-ON camp for a little while, so it was very very exciting to read the forum post by Tsubasa about their musical collaboration with the fairly well-known 4-man group GReeeeN! GReeeeN shot to the top of the Oricon charts during the summer with their single Kiseki, and the two bands have joined together to form a new band under the Avex trax label cutting edge called BAReeeeeeeeeeN, pronounced ???? (Bariin). The producer of this new group is JIN, Hide (leade member of GReeeeN)’s older brother, who is also known for his role as both the guitarist of P.T.P (PaymoneyTomyPain) and the producer of BACK-ON. Apparently he is the mastermind behind the entire collaboration. BAReeeeeeeeeeN‘s debut single, which is out on October 1st 2008, doesn’t seem to have a title per-se but may actually be called ?? (Ashiato) which is also the name of the title track. The B-side, or second song, is called color. You can already listen to an mp3 version of the first track (see Tsubasa‘s forum post, a big thank you!) and now that I’ve heard it, I can definitely say it’s a really really catchy song! It’s a fantastic blend of the musical styles of both groups – mixing pop, rap and rock – where (since this *is* a fansite about BACK-ON): Teeda features as the lead during the second part of the first verse of the song and the bridge; you can hear Kenji03 in the chorus; and there is of course the underlying guitar, bass and drums from Shu, Gori and Icchan, and although I LOVE the bridge, the intro of the song is already catchy enough to get people moving! JIN is quoted as saying that its meant to be a fusion of GReeeeN‘s singing-in-harmony and BACK-ON‘s rapping. According to Tokyograph, Ashiato was already making tidal waves on USEN and chaka-uta since its release around 3 weeks ago, but we heard from from gangangan03 (who kindly sent us a link to this Yahoo! 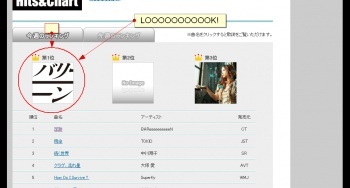 article) that the song actually reached #1 in downloads for both providers. To give a bit of background info (with special thanks to wao for being so helpful and providing this information): USEN is an ISP that provides digital content for download, the chaka-uta (short for “chakushin merodi” or “ringtone”), provides full song ringtone downloads. You can actually see the song in the #1 position on this week’s USEN charts. According to the aforementioned Yahoo! article, the Ashiato has been downloaded more than 200,000 times in the past two weeks, and is already making history as being one of the most popular songs for an ‘unknown’ band. BACK-ON was mentioned as one of the potential bands, by blogs such as MUSIC TRIP~??? ?~ (who also posted the lyrics to the chorus of Ashiato) amongst others such as Hi-Fi Camp. To add fuel to the (blazing) fire, three companies mu-mo, Casio and Kirin decided to work together to produce CMs featuring Ashiato to promote their products (mu-mo, Exilim 2300 and Smooth respectively) on TV (which you can watch here) which only served to fan the flames of BAReeeeeeeeeeN.com‘s mysterious image. 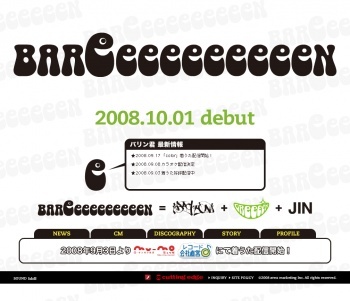 BAReeeeeeeeeeN = BACK-ON + GReeeeN + JIN! Needless to say, the 10 e‘s that are in BAReeeeeeeeeeN represent the 10 people involved with the new group (BACK-ON‘s 5, GReeeeN‘s 4 and JIN) and the name is a mix of the two bands BA and Reeee(eeeeee)N.
p/s: A big thank-you must go to wao for being so helpful during our research for this post. p/s2: Watch the PV courtesy of satsukidabesa on Dailymotion! Watch BAReeeeeeeeeeN – Ashiato PV online! BACK-ON featured on Fuji TV’s とくダネ! (Tokudane!)! BACK-ON features on Oricon’s RANKING Paradise and flyaway reaches Top 10 in the daily Oricon Singles chart!